There is no doubt that vocational studies as a pathway to employment are becoming ever more prestigious. Recent news that privately educated pupils have been warned by Girls' School Association president Hilary French they can no longer afford to be 'sniffy' about apprenticeships, and also that MI5 and MI6 are now recruiting apprentices, bear testament to this. As ever more employers and educationalists recognise the merits vocational qualifications can bring to both the organisation and the individual, we are at last witnessing the kind of ground-level change industry leaders have long maintained can help meet challenges currently faced by the UK economy. When entrepreneur Doug Richard called for a re-definement of, and greater diversity in, apprenticeships just 12 months ago, the news GCHQ would be hiring dozens of apprentices could not have provided a more perfect illustration. His subsequent report, the Richard Review of Apprenticeships in England, highlights the need for greater investment incentives in apprenticeship training from the employer's perspective, and I'm sure MI5 and MI6 will prove to be great ambassadors in encouraging others to follow suit. But there is also another need outlined, which is that dialogue between employers and Government should be ongoing to ensure the quality of training is preserved during this process. Richard asks how apprenticeships can meet the needs of the changing economy in future and ultimately, this depends on the skills our young people emerge from apprenticeships with, whatever form their training may take in the future. Employers and training providers alike must ensure that any qualification remains rigorous and comprehensive in relation to a candidate's chosen industry, and not targeted for the specific needs of an individual's employer. As the popularity of alternative apprenticeship formats increases this must not get lost in the transition. If the focus is overwhelmingly on the specific needs of the individual's employer, might this limit the scope of the training and leave the trainee with gaps in their knowledge, should they wish to work elsewhere in the industry? Moreover, it could risk making apprenticeships less attractive and less respected, and ultimately reduce the talent pool available. Richard acknowledges that apprenticeships need to be held in higher regard, and I believe preserving the quality and scope of training involved will prove vital if we are to continue building on the prestige through association with MI5 and other esteemed organisations. An ongoing relationship between employer and learning provider, provided it is an open and balanced one, will continue to help raise the prestige of apprenticeships and promote parity of regard between vocational and academic learning/qualifications. In Wales we do this through the stringent regulation of providers that work collaboratively to ensure the qualifications on offer are both industry relevant and provide youngsters with as comprehensive and wide a skillset as possible. The UK Commission's 2012 Employer Perspectives Survey shows us that employers in Wales have the highest uptake of vocational qualifications* out of all the four home nations, but there is no room for complacency yet. The endorsement of organisations like GCHQ and the Girls' School Association is both helpful and encouraging to the cause, but I believe we must ensure the apprenticeship system as a whole remains a collaborative effort and does not become a process led by any one group - be it employers, educationalists or the students themselves. As the drive to meet industry skills gaps present today gathers pace we must not forget, as industry leaders, that our young people are looking towards futures in their chosen fields that will far exceed our own, and must therefore be appropriately skilled not just for today but for tomorrow's business landscape too. *Overall take up of vocational qualifications remains around the same level as it was at the time of the 2010 survey (28 per cent of all employers, equating to 38 per cent of those who provide any training). This figure was higher in Wales (29 per cent), England (28 per cent) and Scotland (26 per cent) than it was in Northern Ireland (22 per cent). This article first appeared on the Huffington Post. Click here to read it in its original context. Scott Waddington makes a good and, I believe, crucial point. Whilst today I have the honour to lead a professional body that sets standards for bookkeepers and is also an Ofqual Recognised Awarding Organisation, I was previously an inspector of apprenticeship training for over a decade. 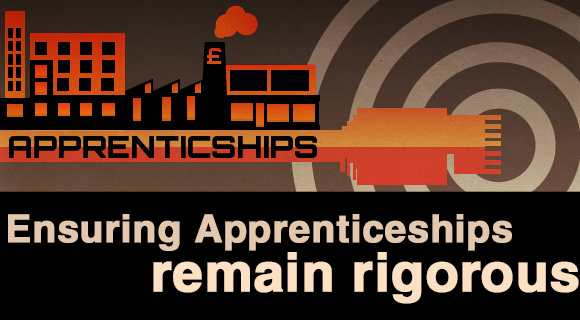 Whilst the Richard Report urges us rightly to ensure that apprenticeships are what employers want and are, where achievable, less bureaucratic, my serious concern is that all the good and effective work that has been done to raise standards over the past 15 years could easily be thrown away in favour of sloppy and unreliable assessment, with no national standard of either content or achievement. IAB has in fact radically created qualifications in bookkeeping and payroll for the two existing apprenticeships in this field which are much less bureaucratic than many if not all other frameworks. Let's look at existing good practice in the 'Trailblazer' project getting under way and build on that rather than yet another (and potentially retrograde) educational change.